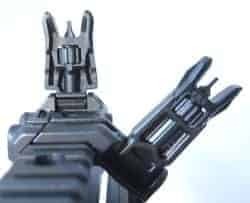 Backup Iron Sights probably got their start by doing absolutely nothing when an optic was bolted onto a rifle that came from the factory with irons. But when modern sporting rifles (or whatever silly name the AR15 is being force-rebranded as these days) irons became an deliberate option. BUS or back up sights (whether iron or not) appeared as conventional sights left in place, as well as sighting tools such as notches and even dedicated sight-like things bolted onto scopes, red dots and anything else someone somewhere thinks might fail. Where the problem really started is with the quality, cost and effectiveness of our current crop of backup sights. The BUS concept was just too great to ignore in the highly unlikely event that a battery would die four years too soon, or amazingly strong optics in cushioned metal tubes might crack. Or that drop out of a helicopter knocks your scope out of alignment but leaves the rest of your gun safe to operate. In other words, people wanted to use the fabulous iron sights as well as their optics extracting the benefits from both. The odd thing about the Magpul MBUS Pro Offset Iron Sights are that they are not just for backup anymore. In fact the term “backup” has been relegated to just a single letter in the MBUS trademark, and never mentioned again. By offsetting the sights, they work fine even with a heavy optic running on the top rail. In fact, they don’t just back up the optic, they supplement it by being just as effective doing their job as a 3-9x scope. And the offset aspect of these offset sights allows a natural platform for iron sighting with a slight twist of the gun. Forty-five degrees to be exact. So perhaps a MOSS (Magpul Offset Supplemental Sights) trademark is in order? Using the same steel processing method as the Magpul MBUS Pro sights I reviewed earlier, the Magpul MBUS Offset Sights give you a similar high performance but at a 45 degrees east option. BUIS or Back Up Iron Sights are a staple to any AR user who employs electronic or magnifying optics. Until recently, the main concept behind BUIS was far more the BU than the IS. But with the Magpul MBUS Offset Sights, the Iron Sight aspect gets 24/7 attention, and not just when the optic goes down which happens…like never. In fact, the Magpul MBUS Offset Sights offer an additional level of sighting ability given that they allow for zero to 100 meter sighting capabilities in 100% addition to whatever optic is above the receiver. In other words, you have two complete and independent rifle sighting solutions. 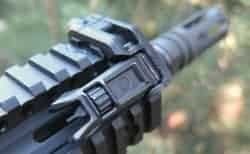 One works close up and the other for whatever the glass on your rifle frame is best suited for. As Magpul was busy finding bolt-on aiming solutions, they were also listening to customers. And one of the interesting requests from actual users was for a smaller front sight pin allowing better accuracy….well, rather better precision if we want to split etymological hairs…which we do. For the record, accuracy is how close you are to the bullseye. Precision is group size. The MBUS Pro Enhanced Front Sight Post, or (MBUSEFSP?) is a screw-in replacement to the regular MBUS Pro and MBUS Pro Offset front sights. The Enhanced post is a match-grade scant 0.04 inches wide, or a full 0.02 inches narrower than the standard post. While talking in hundredths of an inch doesn’t seem like much, it makes big difference in the real world. For most, the MOE 0.06” front post is plenty small. But for those who anticipate more a 50 or 100 meter use of the backup or offset sights, then the the enhanced post is an excellent option, and well worth the paltry ten bucks Magpul asks for it. But wait, there’s more. Since the post does not rotate as you adjust the elevation like the old A2 front sights did, you can physically rotate the post 90 degrees and wa-la! You now have your thicker 0.06 post painting your target just like old times. So my question: Why is the MBUS Pro Enhanced Front Sight Post not standard equipment on the Pro sights? Or MOE (Magpul Original Equipment) as Magpul likes to say. But I digress. The Magpul MBUS Offset Sights have the same look and feel of the regular MBUS Pro sights including the non-locked positioning, solid detents at flat and deployed, and the same easy tool-less adjustment front and rear. All the MBUS Pro sights are made of case-hardened steel and finished with Melonite QPQ™ which is just a big fancy way of saying that one of the final finishing steps uses a quench-polish-quench nitrocarburizing case hardening process. The gamut of BUIS materials runs from plastic, to polymer, to aluminum, to basic steel, to hardened steel. And I assume that titanium is not far behind, but with a price tag halfway to four figures. The material of a back up sight is not inconsequential. Nor is the build quality. Ignoring the constant usefulness of the Magpul MBUS Offset Sights for a moment, let’s consider some scenarios where you really need back up iron sights. 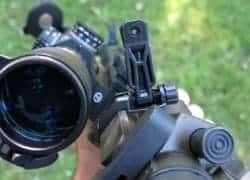 If running a magnifying optic, the two main reasons you need back up sights (ignoring the offset, remember), is when you optic is broken or knocked too far off zero. In both cases there is a good chance the backup sights also experienced the turmoil that killed the optic. If a 1x electronic optic is the main player in your sighting system, the same two maladies as with the magnifying optic are still real, as well as an electronics failure or dead battery. In all cases, the backup sights need to be robust enough to take some shots without complaining. Otherwise they are little more than rail candy. 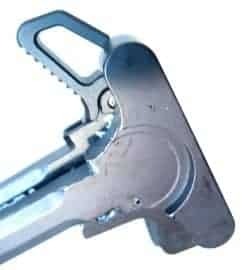 Being offset sights, the mounting position cannot be directly under the sight since there is usually nothing under the sight 45 degree off vertical. Therefore the sight works best when clamped to a rail in the 12 o’clock position. Usually never a problem on the muzzle end of the long gun, but it can present a quandary for some billet uppers (rather than forged), and non-GI issue charging handles like those with ambidextrous controls. On one of my testing carbine-length platforms, the rear Magpul MBUS Offset Sight conflicted with my Raptor charging handle. For proper operation I would need to either swap out the Raptor for a lower profile handle, or move the rear Offset sight further forward. But it just got more stinky from there. The offset sight could not overcome my billet forward assist/case deflector, and I certainly did not want it hanging out above my ejection port. Soon I had the rear sight forward of my Aimpoint Micro T1. Now I was able to employ only half the possible sight radius, and the peep hole was anything but quick on target. I had to rethink the point of back up sights, and especially offset ones that I fully intended on using in addition to my optic but not a enhanced charging handle. Another issue I encountered is that my rifle-length AR has Magpul furniture with no flat top up front. The rear sight behaved itself this time, but there was no easy solution to mount the front sight. I almost added a inch-long Magpul rail the top of my handguard, but that would put the sight up half an inch and out of reach of the rear sight. So for now, that rifle will have to wait. To explore the right/left handedness of the Magpul MBUS Offset Sights I mounted them correctly but held the rifle left-handed. I also mounted them backwards on the left side of the rifle for muscle-memory comparison. Left handed shooting is a mirror of right handedness. Shoulders are switched. Hands are reversed. And barring backwards eye-dominance, everything else is the same. Other than non-ambidextrous fire controls, the operation of the gun is symmetrical. Which means the right-hand preference of the Magpul MBUS Offset Sights requires a slightly unnatural counter-rotation of the rifle to engage the sights with the eye. Instead of the trigger-side elbow rolling away from the body, the trigger arm must fold under the rifle leading to a counterintuitive twist where holding the rifle still is a new skill to be mastered. 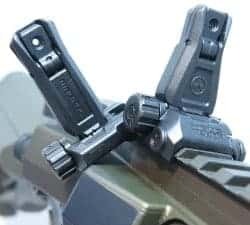 I’m not sure the market for left-handed Magpul MBUS Offset Sights is deep enough for Magpul to take the financial plunge, but it would be a nice offering to our often neglected left-handed brethren. The weight and cost of the Magpul MBUS Pro Offset Iron Sights are commiserate with others in this space. So what does Magpul have to offer that the other options don’t? Three things immediately come to mind. First, the performance of the Magpul MBUS Pro Offset Iron Sights is exceptional and does exactly what it needs to do. Second, the low weight, low profile sights become almost invisible when you don’t want them active. And third, being Magpul offspring, they have a proven warranty and exceptional customer service to back up their products even when your backup is a primary.